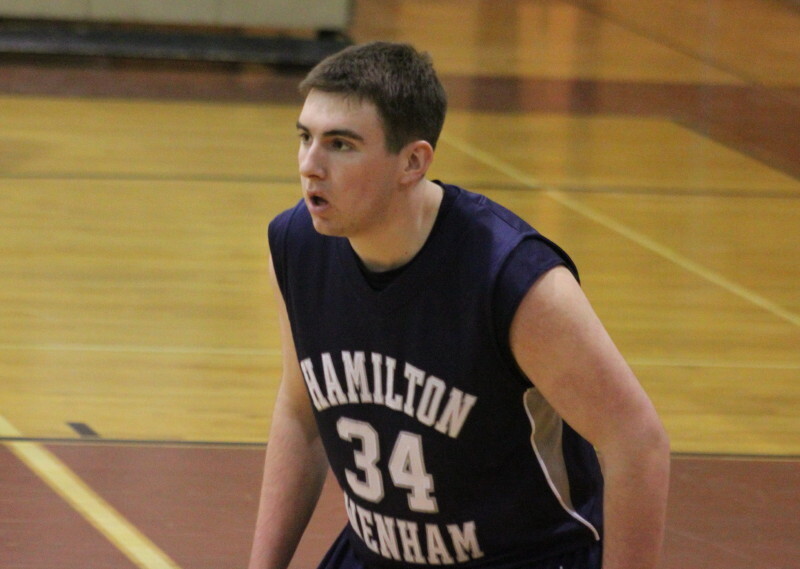 Stephen Tam (25 points) sends Hamilton-Wenham ahead in overtime with a 3-pointer. 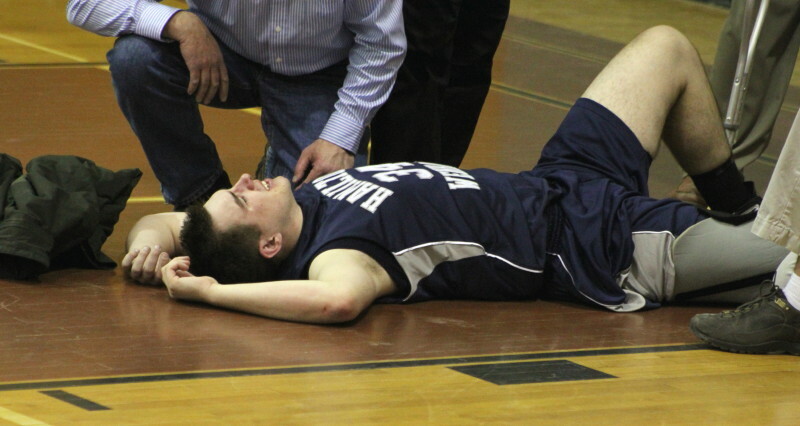 (Boxford) Hamilton-Wenham (13-2) defeated Masconomet (11-5) in overtime, 69-61, on Monday night but the luster of the victory may be dulled by the loss of Pat Hendrickson to a severe knee injury. Pat Hendrickson on the floor with what looked to be a severe knee injury. Pat went down in the last minute of regulation on a drive to the basket. The game was delayed for some time as Masco’s trainers examined Pat and decided that outside medical help was required. Help arrived and Pat was put on a stretcher and given a rousing sendoff by the spectators from both sides. Pat’s drive resulted in two free throws. Colin Kenny made both and the Generals were up by three (56-53) with 35 seconds left. 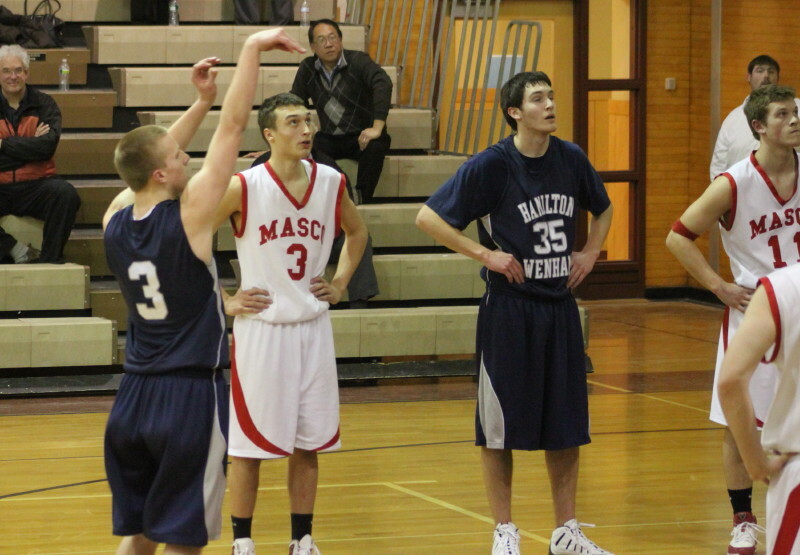 You didn’t have to watch this game for very long to know who would be taking the shot for Masco (Adam Bramanti). You just didn’t know where he’d shoot from. 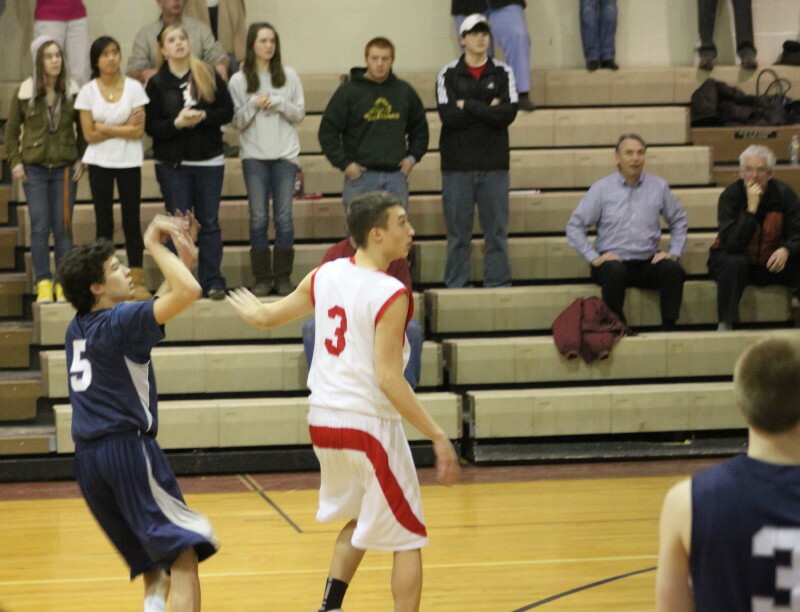 He got open on the right side and tied the game in front of the Masco student section. Hamilton-Wenham had plenty of time (28 seconds) and after a timeout seemed intent on running the clock down to just a few seconds before shooting. Unfortunately, Stephen Tam dribbled the Generals into a five-second violation. 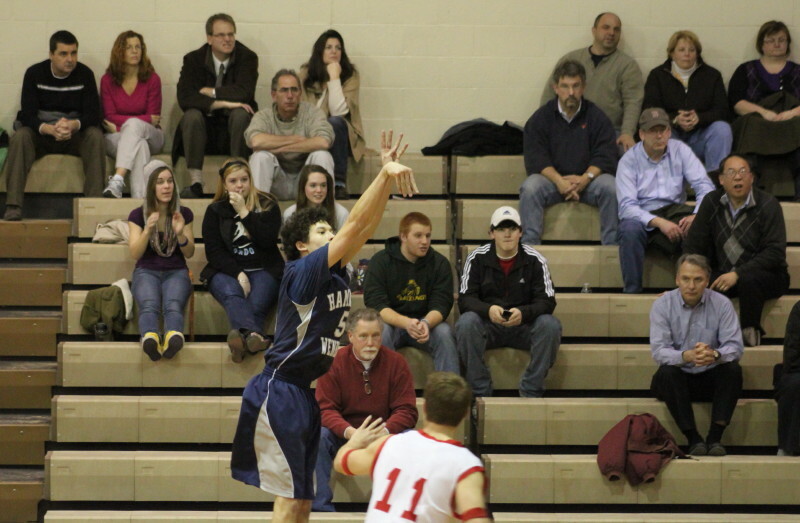 Adam Bramanti (28 points) forced overtime with this late 3-pointer. That left Adam now with a chance to win the game with eleven seconds to do it. He got over on the right side again but this time missed and Colin Kenny got the rebound to send the game into overtime. Jake Lindland (13 points) hit five-of-six free throws in overtime. than enough to stay ahead of the suddenly cold-shooting Chieftains. One of Stephen Tam’s 3-point attempts. The willingness of both teams to put up 3’s was an eye-opener for me. I’d seen Salem connect on fifteen on Sunday night but in this game both teams were at it. 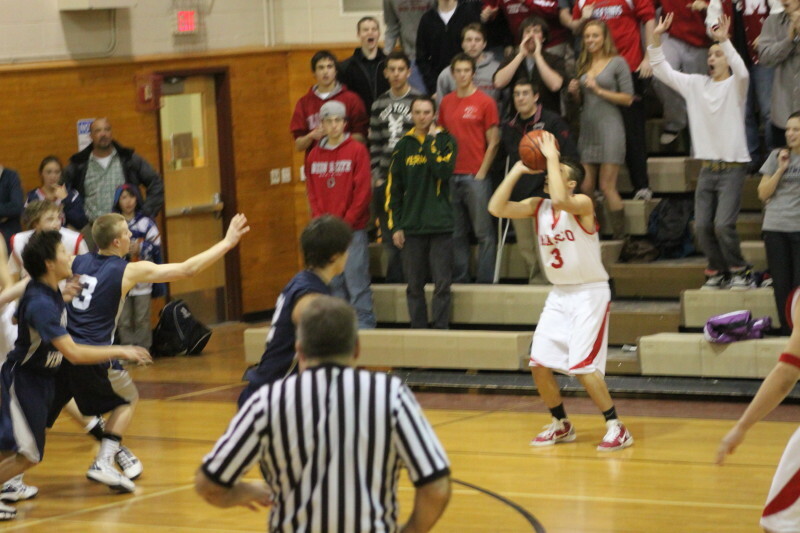 Masco and HW combined to launch sixty 3-point attempts which was more than half the shots attempted in the game. Adam Bramanti (eight 3’s and 28 points) and Stephen Tam (six 3’s and 25 points) made long ones in every period as well as overtime. They never seemed to be out of range. The Chieftains used their size to get second-chance baskets in the first quarter and led 15-10. HW rallied at the start of the second quarter with eight straight points (3’s by Pat Hendrickson and Stephen Tam plus two Chris Hamilton free throws) to jump ahead 18-15. However, Masco closed on an 8-2 run (3’s by Ben Panunzio and Adam Bramanti plus two Zach Zaniewski free throws) to lead at the half 34-27. 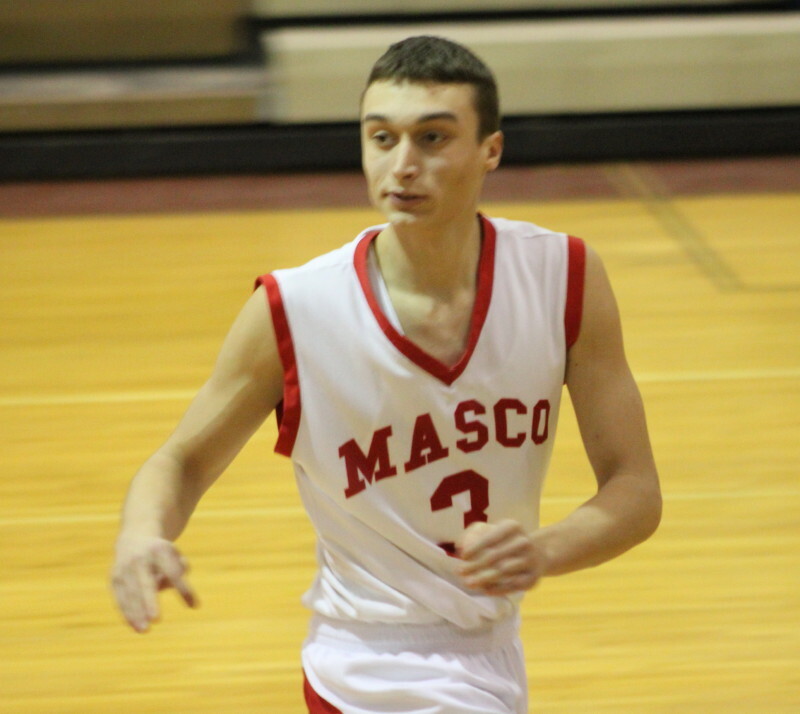 It took Masco three minutes to score a point in the second half and by then HW had connected three times from long distance (Pat, Jake Lindland, and Stephen) to surge in front, 36-34. The Chieftains would end up chasing HW the rest of the way before finally tying the visitors, 58-58, very late in regulation. Thereafter, both team had a chance to win in regulation, which they didn’t, and then HW took charge in overtime. The loss had to be troubling for Masco coach Frank Shea. His team had all sorts of size advantages but after the first half were far too content to try and get three points per possession. Zach Zaniewski had a big first half (12 points). Zach Zaniewski collected twelve points in the first half and then the 6’6” inside threat disappeared from the score sheet. Pat Hendrickson had fifteen points while Jake Lindland added thirteen for the Generals. If HW had lost this game the culprit would have been easy to spot – free throw shooting. The team made just 23-of-38. Do kids practice that shot anymore? 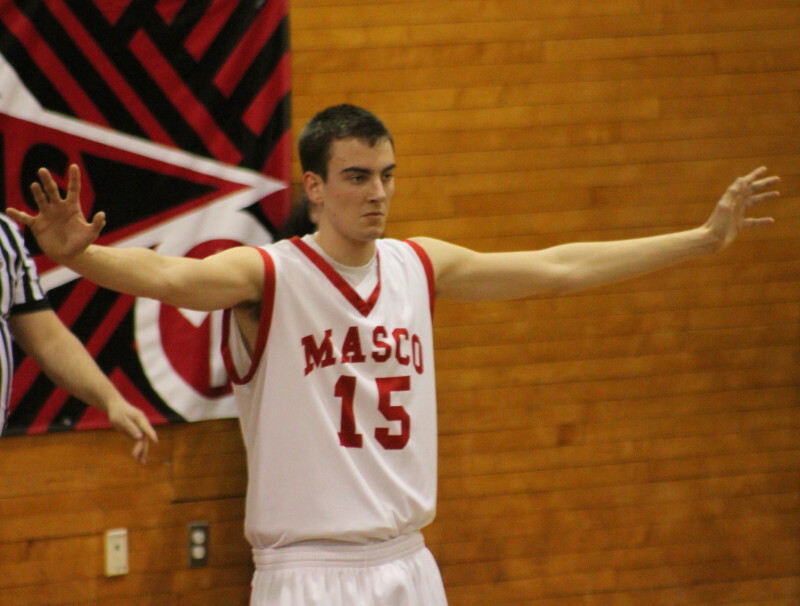 All five of Masco’s losses have been at home. The crowd size surprised me considering the records of the two teams.